KATHMANDU, Oct 10: The ambassador of the European Union for Nepal, Veronica Cody said that she will take the initiative to remove Nepal's name from the blacklist of the European Union. In an interaction program organized by Nepal Chamber of Commerce in the topic of Business, Tourism and Investment: Possibility of Nepal- European Union Economy she suggested that there should be a separate division of the policy for the regulatory body and service providers to safeguard Nepal's air traffic. Ambassador Cody emphasized that physical infrastructure is required to develop trade, tourism and investment in Nepal. She said that the development of railways, roadways and waterways will play a great role in the development of Nepal. 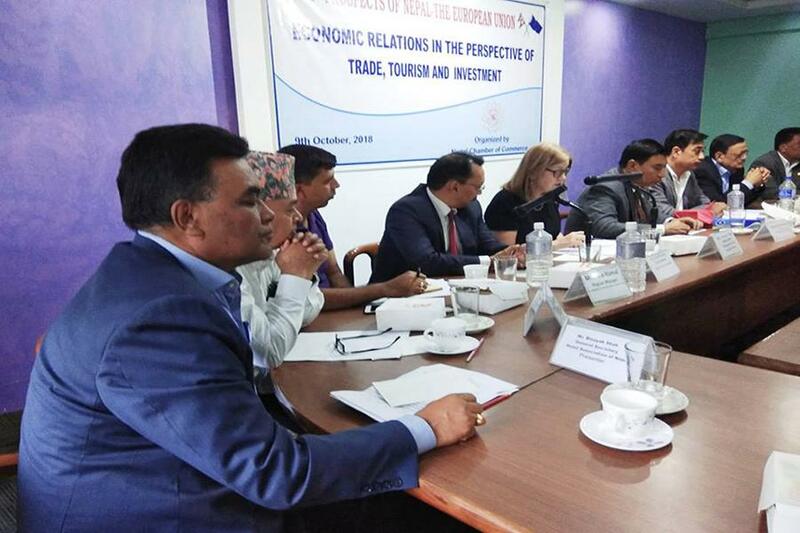 "European Union's association’s relation with Nepal will be stronger," she added. Rajesh Kaji Shrestha, Chairman of Nepalese Chamber of Commerce urged the EU to consider its decision again about Nepal's air traffic in Nepal as Nepal Tourism Year 2020 is near. He appealed to take the decision of Nepal's air safety in a realistic way. Shrestha mentioned that the time has come for EU to help Nepal on trade, tourism and investment. Various worksheet presented by the Binayak Shah, of Hotel Association of Nepal(HAN) , Rajendra Malla , Sr. Vice President and Naresh Shrestha, Vice President of Nepal Chamber of Commerce on Business, Tourism and Investment.